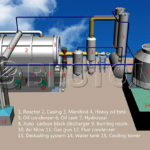 The plastic pyrolysis plants are designed to turn waste plastics into pyrolysis oil and carbon black. 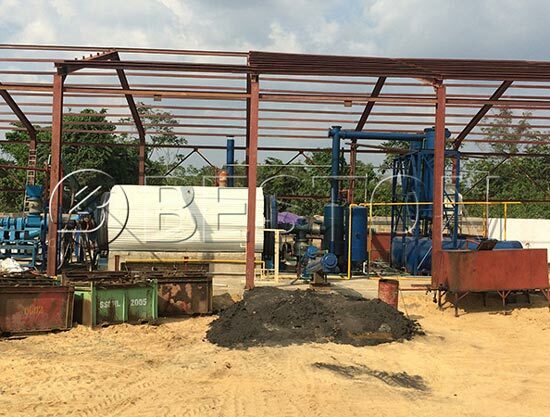 As the leading & professional pyrolysis plants manufacturer, Beston plastic pyrolysis plant design has the features of large capacity, good performance, low cost, this makes it become more and more popular in the domestic and foreign markets. In general, a complete set of plastic pyrolysis plant mainly contains the following parts: they are Pyrolysis Reactor, Casing, Auto Feeder, Auto discharger system, Manifold, Heavy oil tank, Condenser, Oil storage tank, De-dusting system, cooling tower etc. 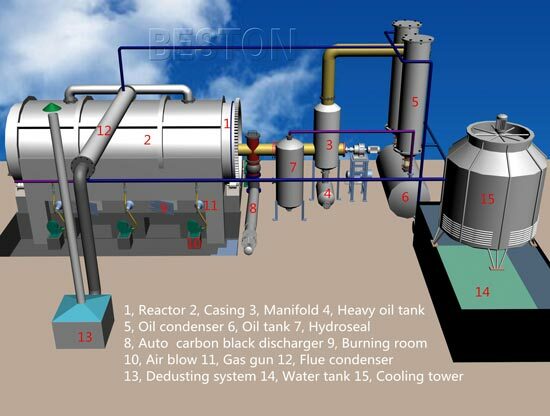 Pyrolysis Reactor: It is the main part of the pyrolysis system, solid wastes like waste plastic, tire, rubber, medical waste and oil sludge can be processed. And oil gas will be generated when the temperature inside reactor reaches 100°C, 250-280 °C is the temperature of large amount of oil gas output. Casing: It will be used for protecting the reactor and isolating the oil based cuttings to get in direct contact with the flue gases. 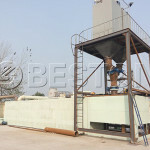 Auto Feeder: It includes the enclosed belt conveyor, base, screw feeder, ball valve, hopper. Auto discharger system: combined with first discharger,steel wire and carbon black separator and 3 sets Secondary discharger. Manifold: oil gas from reactor spiral move into manifold. 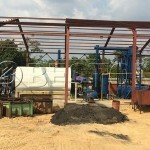 Heavy oil (oil contain fine dust) will be separated from the oil gas and collected into slag oil tank (under manifold). 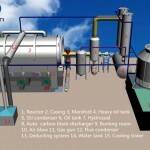 And oil gas will be channeled into condensing system. Heavy Oil Tank: Collecting heavy oil from manifold. Auto heavy oil pumping. Condenser: Tubular condenser is the most efficient condensing system. Heat exchanging area. Liquefied oil gas from manifold. Oil storage tank: It can collect and purify extra un-liquefied oil-gas , so as they can be piped into furnace for heating. Save energy, burning without odor and dust. Water inside it will condense and will be separated by the oil-water separator. The remaining oil will be collected in the oil tanks. De-dusting system: We have strictly de-dusting system to clean the emission, which can meet the local environment protection standard. The system has three layers, water washing, ceramic ring adsorption, water spray. Many gauges will show the running status always. The outlet blockage prevention technology. All enclosed slag discharging system. When pretreated plastic was put into the pyrolysis reactor, and until the whole pyrolysis process is over, we could get some carbon black, pyrolysis oil from plastic waste. They all have a wide range of applications. For example, the plastic oil can be used as industrial fuel materials for burning, or can be further refined to diesel or gasoline through the waste oil distillation equipment. The carbon black can be reprocessed into high-quality carbon by the carbon black processing machine or can be used as fuel directly. 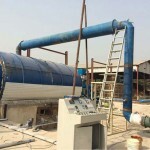 At present, our company has designed six types of plastic pyrolysis plants. They are BLJ-06, BLJ-10, BLJ-16, BLL-20. However, the operating system and handing capacity of these plants are different. Look at the details below and you will find the differences. At the same time, we will give you a free quote.